The decline in the US$ index in 2017 has been relentless. From a high of nearly 104 at the end of 2016, the US$ index has steadily declined to as low as 93.00. While this has certainly fueled the strength in precious metals, it has not been able to lift the sector as much as typically expected. That is because Gold’s performance relative to other assets has been weak and much weaker than in 2016. Friday Gold broke above key resistance of $1260/oz but it remains below its 2017 highs as the US$ index tests support amid a very oversold condition and negative sentiment. Simply put, Gold will have to prove itself in real terms if it is going to hold its ground or breakout as the US$ begins a likely bounce. First, let’s take a look at Gold’s relative performance by comparing it in nominal terms to Gold priced in foreign currencies (FC) and Gold against equities. While Gold held the low $1200s and rallied back to $1275, Gold/FC recently broke support and tested its December 2016 low. 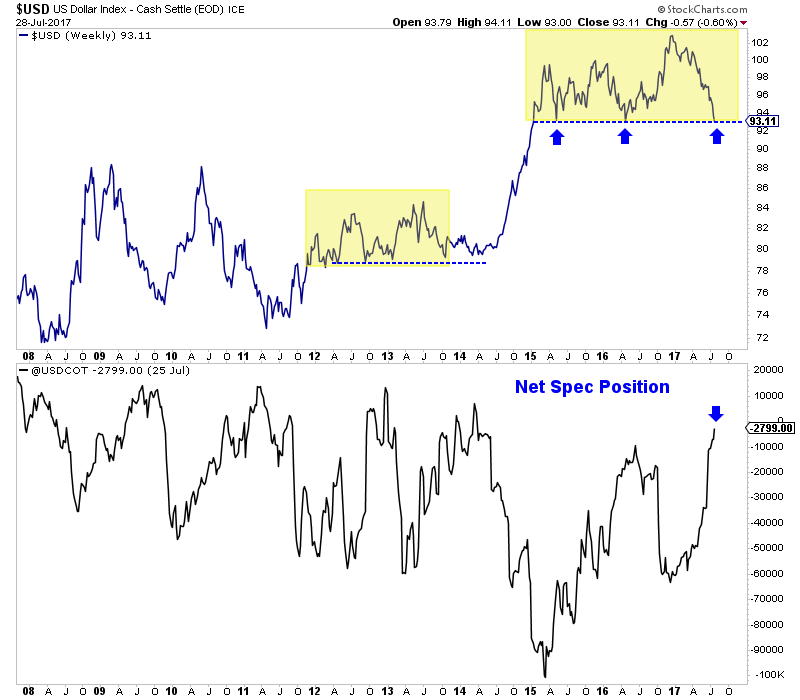 The Gold/equities ratio is rallying from critical support. 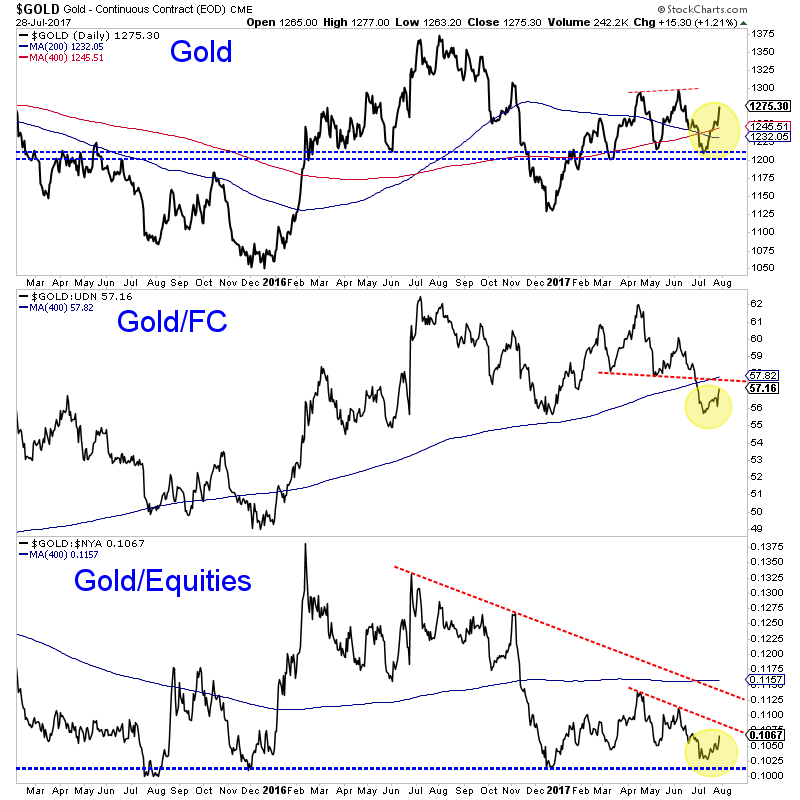 Recent lows in Gold/FC and Gold/equities need to hold if Gold is going to hold its ground also. The reason Gold’s relative performance is critical here and now is because the US$ is very likely to rally and very soon. The US$ index has reached strong support and amid bearish sentiment. The net speculative position (shown in the chart below) is the lowest in over three years. The daily sentiment index (not shown) hit 7% bulls a few days ago. Even if the US$ index is going to break below 92-93 eventually (which I do not expect) it figures to rally first. In any case, a rally in the greenback appears very likely. Although there is renewed excitement and optimism about Gold, it has not made a new high and is likely to be pressured if and when the US$ index begins a rebound. Thus, Gold’s relative performance (which has been very weak this year) will be critical in determining if Gold’s 2017 rebound is merely pausing or if it will reverse course entirely. While gold bulls and bugs are getting excited, we don’t see enough evidence to merit such a stance yet. What would get us excited and bullish, would be a strong move in Gold through $1300. We’d be happy to buy into current strength at that point. We will wait for the market to tip its hat and in the meantime we will continue to try and find the best junior gold stocks for the next 12-18 months. For professional guidance in navigating this sector, consider learning more about our premium service and our favorite junior exploration companies. A lot of people are taking small positions in gold. Will have to watch the price closely the next few months!